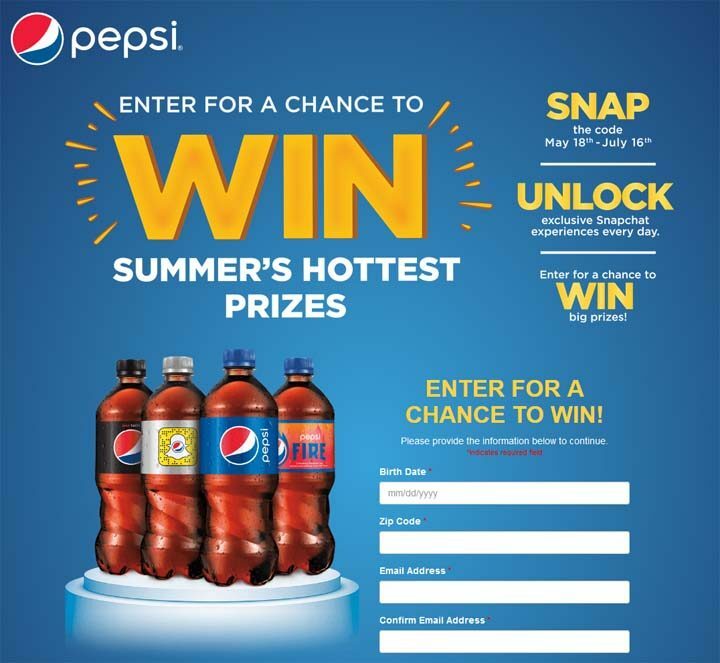 The Pepsi Summer Sweepstakes at Walmart is open only to legal U.S. residents of the United States and the District of Columbia, who are 13 years of age or older. The Pepsi Summer Sweepstakes at Walmart ends on July 16 at 11:59:59 p.m. ET. Visit participating Walmart stores and look for advertising signs containing a Snapcode. Snap the Snapcode on the sign to unlock a lens. Next, follow the instructions on pepsiwalmartsweepstakes.com to complete and submit an entry into the random drawing corresponding to the Day in which your entry was received. Limit one (1) entry per person/email address/household per day. and one (1) Nintendo Joy-Con Charging Grip. ARV: $410.00 each. Nintendo Switch Prize Pack 2 (112 total): Each winner will receive one (1) Nintendo Switch Gaming Console; one (1) The Legend of Zelda Game; and one (1) Nintendo Switch Pro Controller. ARV: $385.00 each. Total ARV of all prizes: $136,780.00. hi i want to win this giveaway.